Europe, China and Asia Coldest in Declared "The Hottest Year". The cold weather that has descended across Europe has continued to set records. 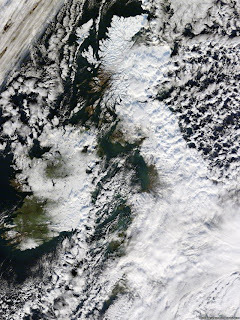 Along with a stunning satellite image. Well, it has happened again, much earlier this year. See the newest satellite image below. That’s twice in one year! The previous time was January and now again in December. But they still want us to believe that 2010 is the hottest year ever! Do they think we are all nuts? An it’s not only the UK. In France, the mercury fell to -15.3 ° C in Orleans. Airports have been closed, Eurostar traffic disrupted, thousands of trucks stranded on impassable roads, and parts of Europe, from Britain to Italy, paralyzed by the freezing conditions. In the Netherlands, temperatures ranged between -5 and -8 degrees Wednesday, the coldest December 1st since 1940 and snowfall Monday night caused 871 kilometers of traffic jams on the highways, another historic record. In Poland the cold wave that hit central Europe has resulted in thirty deaths this week.It dived to -22c in Wroclaw. In Russia, eleven people have died from cold in Moscow since the beginning of the week, including two in the last 24 hours. In the Russian capital, temperatures have reached a low of -20c on Wednesday last. The Norwegian Met office reports this is the coldest November on record since the year 1900, where the monthly average for the country is 3.9 C below normal. In the inland, some places where 6-7.5 C below normal. The Utsira Fyr station located in the middle of the Gulf current south-west of Norway recorded a minimum of -6.2 C, the lowest measured temperature since recordings started in 1867. Besides Europe, China is also reeling under a cold wave. The country’s northern region is under a heavy snow blanket. The snow fall began 2 days ago and continues unabated. Temperatures dropped to minus -22c, the lowest this winter. hi, i am following your blog from 2008 and your weather forecast are better & precise than imd. So keep up the good work.regarding mumbai its been cooler since night and whats the stutus of 95A. svt, thanks for reading vagaries. Your inputs are always welcome. Putting up 95A on the blog now, and forecast for Mah.will be put up tonite.